Explore how gamma-ray telescopes in space and on Earth captured an outburst of high-energy light from PKS 1441+25, a black-hole-powered galaxy more than halfway across the universe. A long time ago in a galaxy half the universe away, a flood of high-energy gamma rays began its journey to Earth. 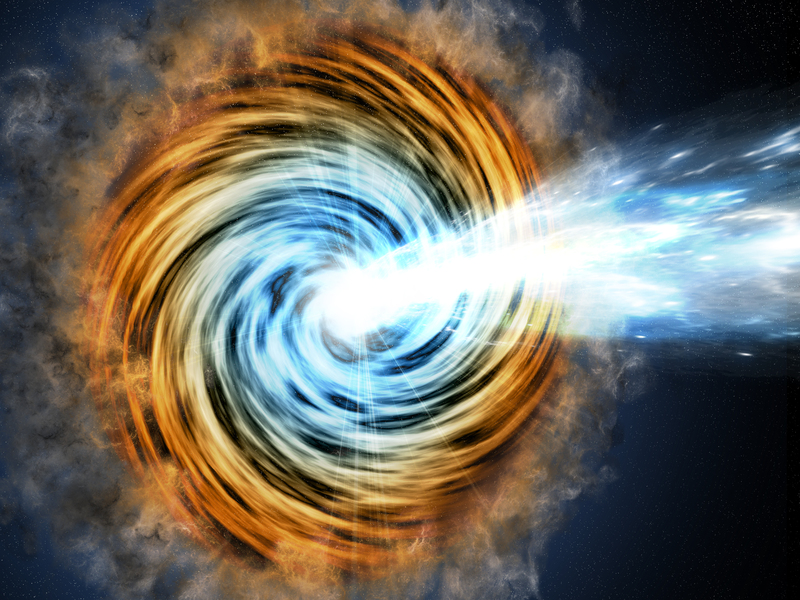 When they arrived in April, NASA's Fermi Gamma-ray Space Telescope caught the outburst, which helped two ground-based gamma-ray observatories detect some of the highest-energy light ever seen from a galaxy so distant. Astronomers had assumed that light at different energies came from regions at different distances from the black hole. 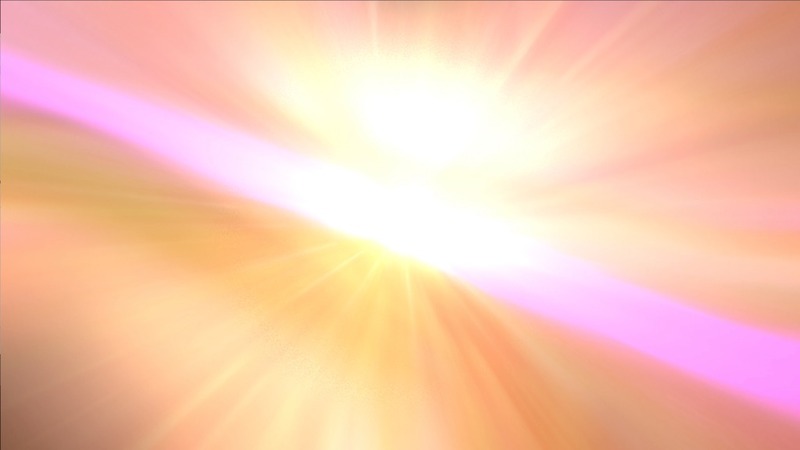 Gamma rays, the highest-energy form of light, were thought to be produced closest in. But observations across the spectrum suggest that light at all wavelengths came from a single region located far away roughly five light-years from the black hole, which is greater than the distance between our sun and the nearest star. The gamma rays came from a galaxy known as PKS 1441+25, a type of active galaxy called a blazar. Located toward the constellation Boötes, the galaxy is so far away its light takes 7.6 billion years to reach us. At its heart lies a monster black hole with a mass estimated at 70 million times the sun's and a surrounding disk of hot gas and dust. If placed at the center of our solar system, the black hole's event horizon -- the point beyond which nothing can escape -- would extend almost to the orbit of Mars. Following up on the Fermi alert, the MAGIC team turned to the blazar and detected gamma rays with energies ranging from 40 to 250 GeV. Because this galaxy is so far away, we didn't have a strong expectation of detecting gamma rays with energies this high. That’s because distance matters for very high-energy gamma rays -- they convert into particles when they collide with lower-energy light. 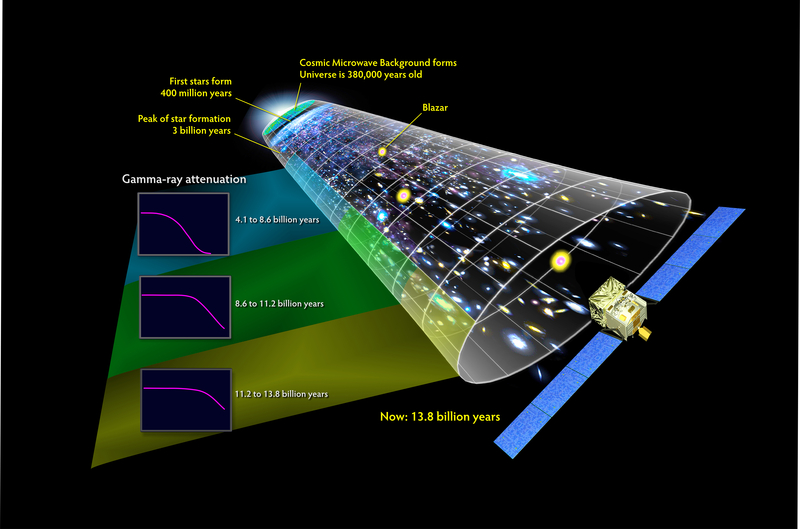 The visible and ultraviolet light from stars shining throughout the history of the universe forms a remnant glow called the extragalactic background light (EBL). For gamma rays, this is a cosmic gauntlet they must pass through to be detected at Earth. 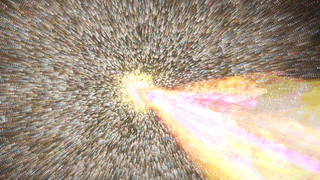 When a gamma ray encounters starlight, it transforms into an electron and a positron and is lost to astronomers. The farther away the blazar is, the less likely its highest-energy gamma rays will survive to be detected. Following the MAGIC discovery, VERITAS also detected gamma rays with energies approaching 200 GeV. PKS 1441+25 is one of only two such distant sources for which gamma rays with energies above 100 GeV have been observed. Its dramatic flare provides a powerful glimpse into the intensity of the EBL from near-infrared to near-ultraviolet wavelengths and suggests that galaxy surveys have identified most of the sources responsible for it.